I’d heard stories of this phenomenon, of the mom who has a baby and then wants to chain the faithful dog outside, or decides that the chattering bird who kept her company all those years wasn’t actually talking. Parents who start a “real” family, only to reject the companions who were family. That wouldn’t be me. My cats had seen me though some tough times, and I intended to return the favor. “You’re wrong,” I told the writing instructor, and proceeded to bet him a dinner that, six months after Martin was born, I would still be doting on the felines. I won that bet. When Martin was born, as he grew, when we got the autism diagnosis, and even after we started the all-consuming process of biomed, our cats retained their stature. We have four of them—Levi, Freddie, Edith, and George—all rescued from the street or the pound. Under our protection, they’ve lived luxuriant lives, indoor-only, replete with toys and top-quality food, scratching posts and climbing furniture, cuddling on our bed at night. What happened, I still can’t figure out. At the time, I thought it started with Freddie. When we lived in the City, we had some problems with Freddie peeing outside his box. Freddie is a small cat, and nervous. Anything can set him off. We hadn’t had any issues with Freddie in the year since we moved to the suburbs. Then a few months ago, Freddie started peeing outside his box again. And not just a little bit. And not in only one spot, as when we lived in the City. Freddie decided to treat our whole house like a toilet: the bathrooms, the family room and dining room, the throw rugs, Martin’s bed. Something had to be done. In consultation with the cats’ veterinarian, I experimented. Different kinds of litter. Moving the litter boxes around. Strategically positioning puppy-training pads in areas Freddie hit repeatedly. We made some progress. At least, more often than not Freddie hit a box or a pad, and clean-up was efficient. Then Levi joined the party. His timing was a wonder. It was a weekday evening, Martin was sleeping, and I had just climbed into bed with Adrian to begin a conversation titled (in my head), “We’ve got to do more to get this Freddie problem under control,” when I heard liquid splashing in our bathroom. I cut the nascent conversation and sprinted to the bathroom to find Levi urinating all over a chair. Levi! Levi, who never in his eleven years had peed anywhere but a litter box! Levi, producing the most dastardly mess. I swore. I dropped an F-bomb and chased Levi from the bathroom. By the time I had the mess cleaned up—originally, more than a decade ago, I brought the cats to my and Adrian’s relationship, so dealing with their, ahem, issues always seems to fall on my shoulders—Adrian was snoring. Our conversation was postposed until date-night dinner that weekend, by which time Levi had become Troublemaker No. 1. Unlike Freddie, Levi wasn’t just peeing. He was spraying, marking his territory by firing urine directly at walls, doors, furniture, and heating vents. You can clean from dawn till dusk. That smell sticks around. Adrian looked like he couldn’t believe what I was saying. To some extent, neither could I. In the 20 years I’ve hosted cats in my home, I’ve been steadfastly against letting them go outside. To some extent, I was being pragmatic; I’ve lived inside Chicago, New Haven, Dallas, New York City, urban centers inhospitable to feline wandering. But my objection extended beyond simple pragmatism, to generalized affinity for animals. 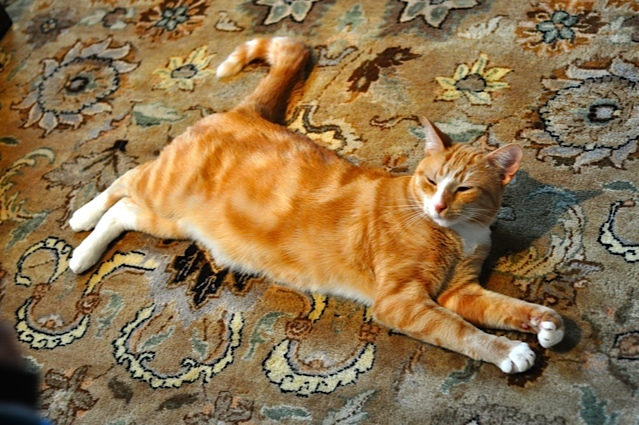 Because of cars, predators, and other dangers, cats allowed to wander have shorter lifespans. Plus, they kill. Inside, my cats kill moths, crickets, flies. Outside, songbirds and mice and squirrels and all sorts of higher orders come into the picture. As I sat there talking to Adrian, in a restaurant, away (thank goodness) from the cats, I realized something: There is only so much pee I can tolerate. Martin still has trouble at night, and occasional daytime accidents. So I’ve dealt with six years of pee from him already. And there are litter boxes. With four cats, I’m cleaning litter boxes all the time. Now I had pee all over my house. Pee, pee, pee. I was done. Adrian and I reached agreement quickly. For the first time since they came to our home, the cats would be allowed outside. I set about taking all responsible precautions, including rabies vaccinations (ugh, let’s not get into vaccinations again!) and flea pills. I asked friends who have outdoor cats, “How do you make sure they come back?” (“They know where the food is,” I was assured.) One Saturday, when we were hanging out on the back deck with friends, we opened the sliding glass doors and left them open. And that was that! Or so I’d like so say. The truth is that nothing was solved. I came to realize that the originator of the pee problem was neither Freddie nor Levi, but our youngest cat, George. George woke up one morning and inexplicably decided he hated Levi and Freddie. I suppose I saw hints: Instead of four cats sleeping on our bed, there were three, with Georgie elsewhere, and there were hisses and swipes, scratches on Freddie’s nose. In the face of George’s wrath, Freddie cracked. He started peeing, I think, out of sheer nervousness. Levi started marking in order to warn George off further aggression. Once the cats were outdoors, their true colors became increasingly evident. George strutted around the yard, chasing Levi clear off the property. Freddie kept peeing, too scared to set paw out the door. Levi increased his marking, spraying every ingress Georgie might access, spraying the back patio when he had the chance. When they were all inside, fights broke out. It was chaos. It was a disaster. I was losing sleep. Imagine this: I have a child with autism, yet what kept me up at night was the fear of who might be peeing where. I woke repeatedly, roaming the house in darkness, looking for signs of trouble. I’ll skip to where we stand now. As of this writing, Levi and Freddie are living in the basement, and have been for more than a month. Tellingly, they both stopped urinating outside the little box almost as soon as it became clear that they were away from George. And don’t worry too much for them. We have a gigantic unfinished basement. I’ve hauled towels, pillows, and boxes down there to create soft and safe spaces. There are crickets to kill, and—ugh—last week I cleaned up a decapitated mouse. There are ceiling-level windows, under which I’ve placed “cat furniture” so the boys can climb and look out. I moved a chair and table into a quasi-office configuration so that I can spend and hour or two with them each day, working. I’m sitting there right now. For now, the problem is solved. The house is clean and fresh. I’m sleeping. Nevertheless, I don’t want Levi and Freddie to live in the basement forever. They don’t deserve it. George started the whole thing. So we’ve come down to this: I’m hiring a cat behaviorist to try to get to the bottom of George’s attitude, of why he started hating Levi and Freddie after years of peaceful coexistence. If the behaviorist can’t help, we will begin trying to re-home Georgie. I will be heartbroken, and I still don’t know if I can do it, but that is the direction we will move. Why, you might be ask, are you reading all this on an autism recovery blog? What does this have to do with Martin’s journey? With Martin’s journey, maybe not that much. But it has a lot to do with my journey as I shepherd Martin. There has been too much on my shoulders. I’ve been cleaning and cooking and researching and conducting therapies and finding schools and trying to keep a household together for too long. Too long. These past few months, including two vacations when I took some break from the madness, have prompted reevaluation, as I wrote last week. If in past years I would have indulged the cats their little spats, if I would have lost the sleep to hose down throw rugs at 2:00 a.m., no more. I have autism to deal with, and somewhere under that burden, I have my own life to forge. My cats will always have access to safe and warm spaces, to healthcare, to food, and to company. Monopolization of my time, or the privilege of ruining my home—those they may have lost. Because autism steals from everyone. One more thing—I know that, with what I write in this blog, I open myself to ridicule. Deservedly so. As I’ve said before: Homemade probiotic catsup? Camel milk? Spending hours in airport security so supplements don’t get X-rayed? Who does that? And right now you’re probably thinking: A cat behaviorist? Seriously? Who does that? Think about this: Eleven years ago, when Adrian and I adopted Levi as a kitten, he came with a case of ringworm so pernicious that, after months of unsuccessful treatment, we were forced to take him to a feline dermatologist. Honestly. A feline dermatologist. So all things considered, Adrian and I might just be getting slightly less crazy. Martin’s dietary needs are leading me to a new relationship with food. That’s a whopper (excuse the pun?) of a cliché, right?—a “new relationship with food.” Sorry. I’m not coming up with a better way to phrase this phenomenon. I’m not an unhealthy eater. I wasn’t an unhealthy eater before this chapter, and I’m not now. I’m vegan. I watch my fats and proteins and vitamins. I love to cook and have always done plenty of it, whenever my schedule permits. Yet until we undertook biomedical intervention and radicalized Martin’s diet, I put relatively little thought into additives, colors, and processed food versus natural. For example, I prefer to make hummus at home, because I can control the amount of tahini (just a dollop) that I add as opposed to lemon juice (plenty) and garlic (vampires refuse even to enter my neighborhood). But from a nutrition perspective, I gave little weight to the difference between (1) blender-whirring raw materials into hummus and (2) buying hummus preserved with potassium sorbate. (Wikipedia: “Potassium sorbate is the potassium salt of sorbic acid, chemical formula C6H7KO2. Its primary use is as a food preservative (E number 202).”) Nor did I consider the benefits of fresh-squeezed lemon juice over made-from-concentrate lemon juice purchased in a green-tinted plastic bottle that also contains sodium benzoate, sodium metabisulfite, and sodium sulfite. Martin’s diet, along with its other restrictions, excludes additives and preservatives—or as I like to call them, non-food items in food. That means just about any processed food is off-limits. Even when it comes to meat: The meat we purchase must come from animals who ate unprocessed (minimally processed, at most) grains grown without pesticides. The fact that Martin, who is so sensitive, has responded so well to the removal of non-food items from his diet got me questioning whether fresher and more natural foods would not benefit the whole family. Neither Adrian nor I suffer neurological impairment or, to my knowledge, complications with digestion or nutrient absorption. Therefore, we probably would not experience dramatic changes like Martin’s. On the other hand, what if reducing our intake of non-food items makes us sleep (a little) better, and feel (a little) more energetic, and concentrate (a little) steadier, and possess (a little) sunnier outlook? Might we not end up (a lot) healthier? Now that I’m no longer employed, I’ve been implementing this like crazy. No more casual eating on the run. On weekday mornings, Adrian and Martin get up at 7:00 a.m. and leave home together at 8:05 a.m. to meet the school bus, after which Adrian heads to work. I, on the other hand, rise at 5:45 a.m. I cook the boys’ breakfasts; organize Martin’s supplements; prepare Martin’s lunch, beverage, and school bag; and also assemble lunch, one protein snack, and two fiber snacks for Adrian to carry to the office. (If the 5:45 a.m. thing is killing me, then at 8:06 a.m. I hop back into bed for an hour.) During the week, no food enters my guys that I have not made myself, except for Martin’s snacks and crackers baked by my mother. • Shim’on Ariche harissa. Ingredients: hot red peppers, garlic, water, salt. Unfortunately not organic. Still, all kitchen-jar approved. • Orgran toasted buckwheat crispibread. Ingredients: buckwheat, rice, salt. Easy call. • NaSoya Nayonaise (vegan mayonnaise). Ingredients: soymilk, soybean and/or sunflour oil, cane syrup, vinegar, salt, mustard, apple cider vinegar, lemon juice, guar gum, xanthan gum, and sodium alginate. Caution! I was okay with everything until guar gum, xanthan gum, and sodium alginate. Not kitchen-jar approved. But in the end, I did buy the Nayonaise. I wanted it for a creamy salad, i.e., as a minor ingredient in a dish headlined by red bell pepper, pear, apple, daikon, onion, carrot, celery, and turnip. Not perfect, but some allowances must be made for tastiness. My kitchen-jar rule is made easier by some unusual ingredients in my kitchen. Rice syrup, for instance. Though it’s not approved for Martin, it makes a gentle sweetener for my grown-up baked goods. Or lecithin. Lecithin pops up in many packaged food, and as it so happens, I do keep a jar of lecithin in my kitchen. It’s Love Raw Foods sunflower lecithin, a supplement we use for Martin, from Blue Mountain Organics. In summary, I have Martin eating 98% fresh, 100% natural, and 99% organic. For me and Adrian, probably 80% fresh, 99% natural, and 80% organic (taking into account our weekend tendency to eat at restaurants). There’s still the issue of our four cats. Currently, they eat Nature’s Variety canned food and dry food. I wish I could do better for them. When I was in graduate school, and had grad-student amounts of time on my hands, I made cat food at home. William the cat, who has long since died, was particularly fond of a garbanzo-based concoction I used to make with Harbingers of a New Age supplements. Maybe someday I’ll manage a triumphant return to homemade cat food. Maybe when Martin is recovered. Until then, alas, I repeat: A day has only so many hours for the kitchen. George the cat, Martin’s best friend. Actually, the only of our four cats who tolerates Martin.